When Zeppelin entered the world of plant engineering many years ago, it was clear to all those involved that the venture would only be successful with a high quality strategy. In order to offer our customers the best solutions possible, we decided to product the key components ourselves. 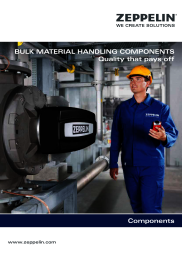 Zeppelin are now considered a leading supplier of components in the bulk material sector and our innovative solutions mean we put you, our customers, at a advantage. Tried and tested, our products are perfectly synced within your system, guaranteeing you the best engineering solutions for your business. You will also benefit from a product selected and designed by the experts at the leading global plant engineering company. If you have any questions or would like any advice, please get in touch.